Eliminate unwanted elements from a photograph, such as plants and rocks. When working on projects using our landscape design software, it is sometimes necessary to remove objects from a photograph. This can be done through a process called "masking" using the Realtime Picture Editor, a program that is included with each of our products. Usually objects will only need to be masked out of landscape designs that are being created in Realtime Landscaping Photo, but the technique below can apply to any photograph you wish to modify. The picture you would like to modify can be opened in the Realtime Picture Editor in two ways. If you designing over a photo in Realtime Landscaping Photo, then simply click Settings, Background Picture, and Edit Using the Picture Editor. Realtime Landscaping Photo will now minimize and the Realtime Picture Editor will appear with your background image. If you are not using Realtime Landscaping Photo, then open the Realtime Picture Editor by clicking your Windows Start Menu, select All Programs, click the name of the Realtime Landscaping Software that you purchased, and then click Realtime Picture Editor. Now that your picture is open within the Realtime Picture Editor, select the Clone tool by clicking its button near the top of the screen. The Clone tool has two small circles that will follow your mouse cursor: the "brush" and the "source". The object of cloning is to "paint" from one part of your picture to another. For example, if a plant was up against a brick wall in your photo, the object would be to "paint" the brick over the plant, making it appear as if the plant was never there. First, right-click to set the "source". The source is what you want to paint with; for example, in the images to the right, the mulch was used as the source for clearing out the bottom of the plant. Next, click on the object you wish to remove, hold the mouse button down, and move the mouse to "paint" using the source. It is best to use short strokes when cloning - this way it is easier to undo small mistakes. While cloning, keep an eye on the "source", as it will move with your mouse while painting. Now that the objects are removed it is time to save your work. If you started the Realtime Picture Editor through Realtime Landscaping Photo, then simply click File and Exit and Return to Realtime Landscaping Photo. Be sure to click Yes when asked if you want to save your work. If you did not access the Realtime Picture Editor through Realtime Landscaping Photo, then click File and Save As. Save your file to a common area you will be able to easily find, like your Desktop. Cloning can be a bit difficult at first, but it gets much easier with practice. Some objects are too complex to realistically remove from a photograph; in these cases it may be better to take the picture from another angle or create a 3D design from scratch using Realtime Landscaping Architect, Pro, or Plus. 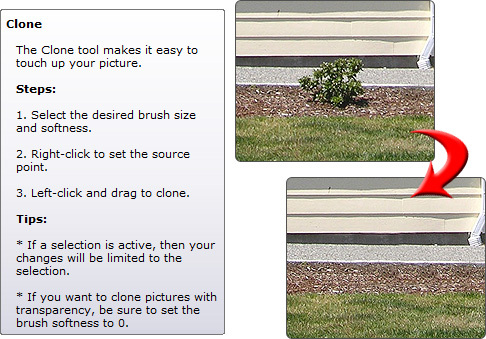 Additional information about cloning can be found by pressing the F1 key within the Realtime Picture Editor with the Clone tool selected. Sometimes it is easier to simply copy and paste from one part of the picture to another. To do this, select the area you wish to copy, click Edit and Copy, click Edit and Paste, and then move the pasted area into position.